Re-Announcing the ROCKY 50 again! The ATX100k 6-Pack Series' gnarly little sister race has arrived!. It will be held December 16, 2013 until January 6th, 2014 at Rocky Hill Ranch. There will be a 50k endurance race, fastest lap contest, and a Hill-climb time trial! This is a Strava/GPS race. As such, you'll have several weeks to complete the events. Imagine, you can win REAL LOOT instead of just a digital KOM! Rewards - 50k first place winners get a trophy and a pro-tune from TCW. Fastest lap winners get a $25 gift card from TCW. Hill climb winners get a trophy and a Deluxe tune from TCW. If you win all three prizes we'll spot you a free jersey (totaling your loot at well over $200). All distance at the 50 counts towards your total distance to get in on the jersey. Top men and women will auto-qualify for a jersey in both the 50k and the Hill-climb. Top 3 places men and women get an award. This will be a four-lap event on some of the tougher portions of RHR’s trail network. The fastest three men and women will receive Rocky Hill style trophies. The first place winners will receive a Pro-Tune from Texas Cycle Werks valued at $95 each. The man and the woman who logs the fastest single lap while completing the entire 50k above will each win a $25 gift card from Texas Cycle Werks. The lap must occur during their 50k ride. This will require some strategy as you can imagine. This will be a time-trial climb up Fat Chuck’s Demise with some extra zing added on for grins (maybe we will add some log pyramids or something). It will be long enough to allow for accurate STRAVA records but short enough to still be considered a sprint. The fastest three men and women receive Rocky Hill style trophies. The first place winners also each win Deluxe-Tunes from Texas Cycle Werks valued at $75 each. For any man or woman who wins all three of the above challenges, your ATX100K Six-Pack Series jersey is on us. That brings your total winnings to $255. Congrats - you're badass! You have from dawn of 12/16/13 until 8pm on 1/6/2014 to complete the event. That is three weeks of window. No excuses! • The route will be marked and those markings will remain for the duration of the event. • Whoever is top dog in the various challenges at 8pm on 1/6/2014 wins that challenge. We will allow an extra day to sync your Garmin data before we declare a winner. • You can ride this event as many times as you like, so if you have an off day or your buddy beats you by 2 seconds the day after you post a top-ten, you can go back out and retake the glory. • You do not have to ride the 50k and the TT on the same day; whether its your first go around or you are out merely to defend your time on either. • You will be responsible for the RHR land use fee of $10 per day per adult and $10 per night per adult if you camp out. This event is otherwise free. • You must sign two waivers when you check-in at RHR if you intend to compete: Rocky Hill’s waiver, and the ATX100K waiver. Stop by Texas Cycle Werks (http://www.texascyclewerks.com/) after the results have been posted and pick up your prize(s). You will be required to pose for a photo while holding your trophy/gift card as we will ensconce you forever in interweb immortality on our digital podium. Finishing the Rocky 50k gives you 50 kilometers credit towards the 200K aggregate total you need to qualify to purchase the ATX100K jersey. If you need, for example, 120 kilometers still to qualify, ride this the Rocky 50k twice plus the needed laps to get to your 120k mark. 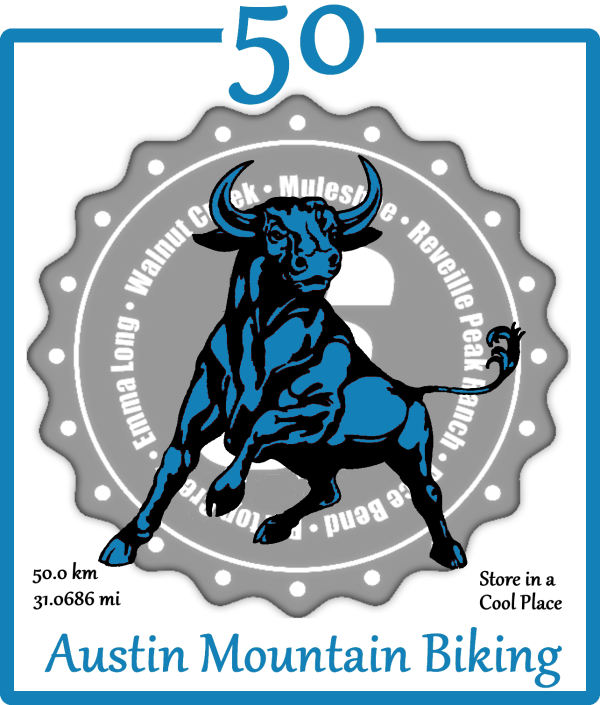 As before, if you already completed a full 100k one-day event (Walnut Creek, Muleshoe, Pace bend, Reveille Peak Ranch), then you already qualify for the jersey. • If you do not STRAVA, borrow someone's smartphone or Garmin and either set up your own account online or use their account but let us know it is you and not them. STRAVA is free to use. • Make sure you post your ride to your facebook homepage and either tag the ATX100K series page, or post your ride directly to the ATX100K facebook page as well. YOU WILL NOT GET CREDIT for your ride if it is not in both places. • Ride the event more than once if you have time to do so. • Ride with friends!! "Pain and sorrow diminish in the company of others whilst joy expounds." Good luck! As usual with our races, this event is completely unsupported. Your success or failure is entirely your responsibility.